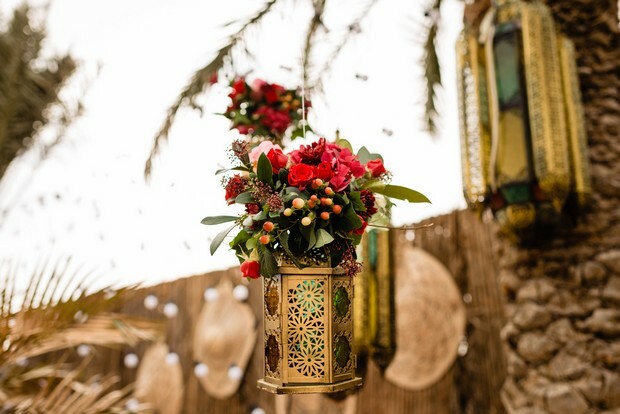 Home > Wedding Blog > Articles | Wedding Décor > The Great Outdoors | Desert Wedding Inspiration from Aghareed. Continuing this week’s outdoor theme, today we’re heading off into the desert. 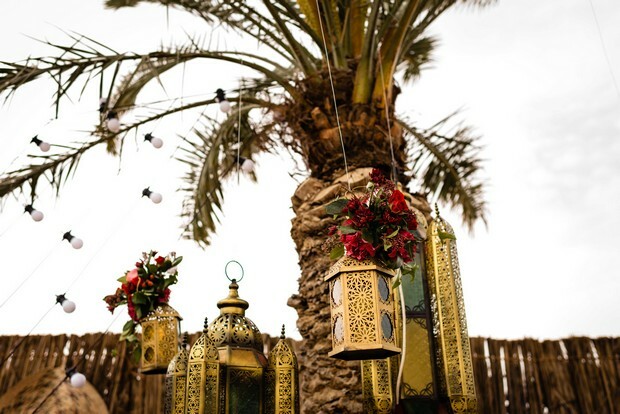 We think there’s something utterly gorgeous and undeniably romantic about a desert wedding. 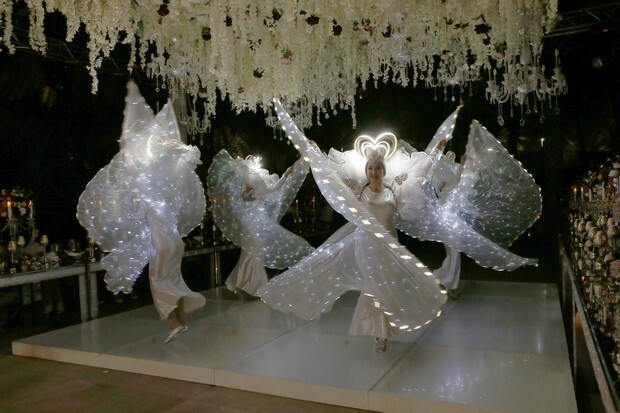 That out-of-the-way location is perfect for brides and grooms who want a free-spirited vibe on their big day. 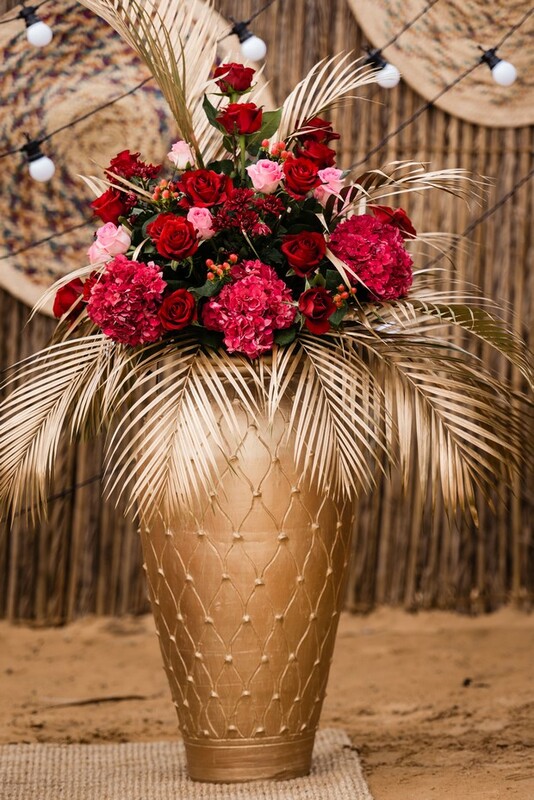 The desert backdrop provides an elegant mix of natural elements, textures and warm tones. Dress it up or go totally boho – it’s up to you! 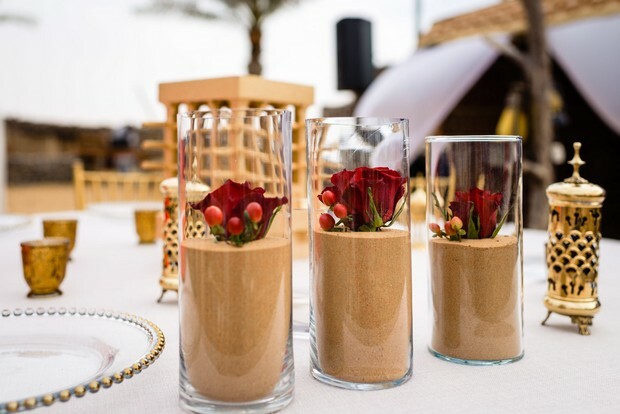 Aghareed styled this memorable desert wedding under the stars! 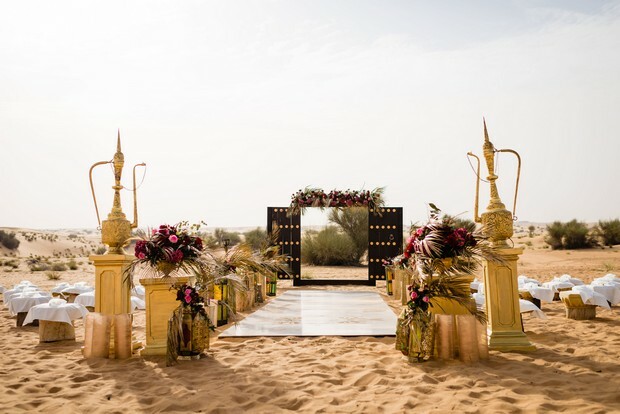 Theme: The couple came all the way from Switzerland to get married in the desert and their theme ‘Magic of the Eastern Sahara’ was sublime. 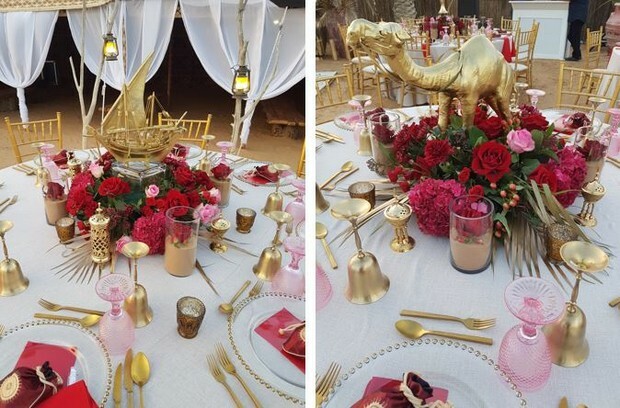 It’s all the country’s Bedouin heritage has to offer with a luxurious and chic twist. 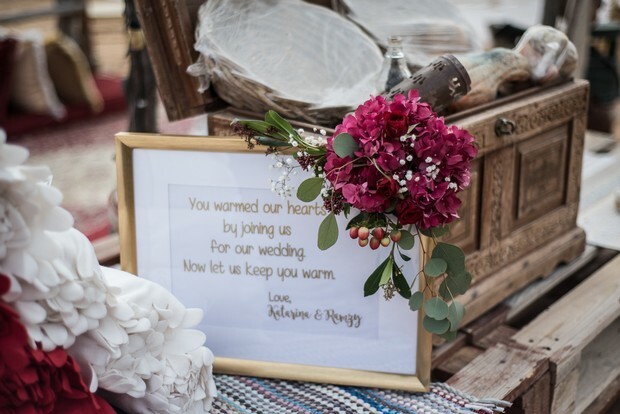 Aghareed have combined Arabic calligraphy, candles with sheer fabric and sparkling glassware, golden palm leaves and Arabic inspired treasure boxes and lanterns. 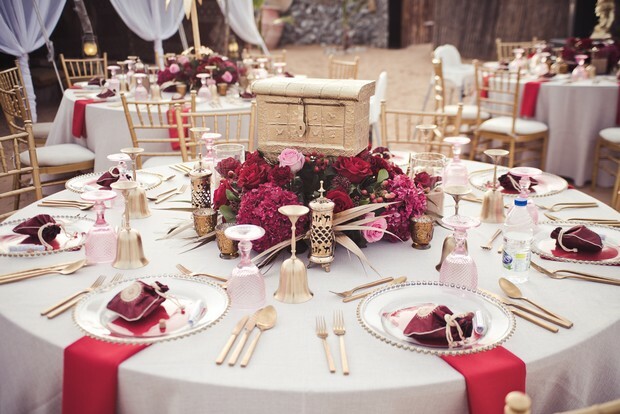 Colour scheme: Gold and maroon with a hint of pink against the unforgettable backdrop of the desert. 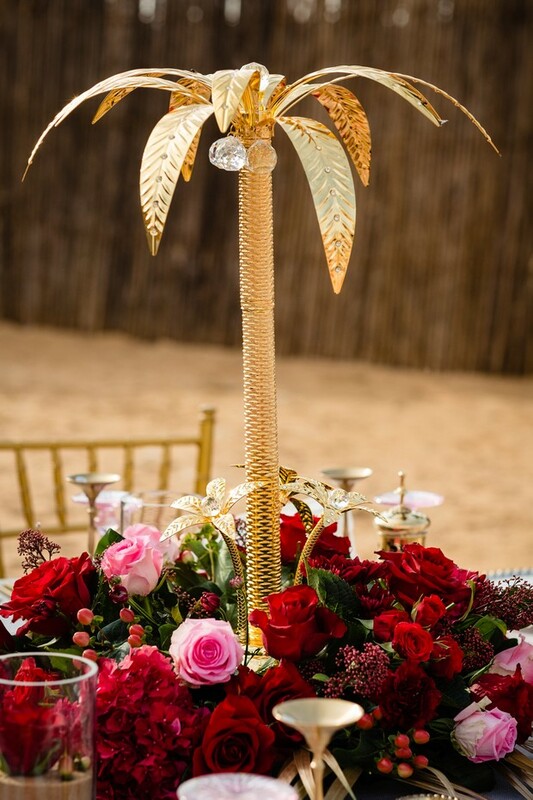 Our Highlights: We simply love the attention to detail taken over the traditional local elements especially the centre pieces: camels, falcons, palm trees – we’re loving them all! The Arabic door is a fantastic and unique replacement for the traditional flower arch or gazebo and great for photos. 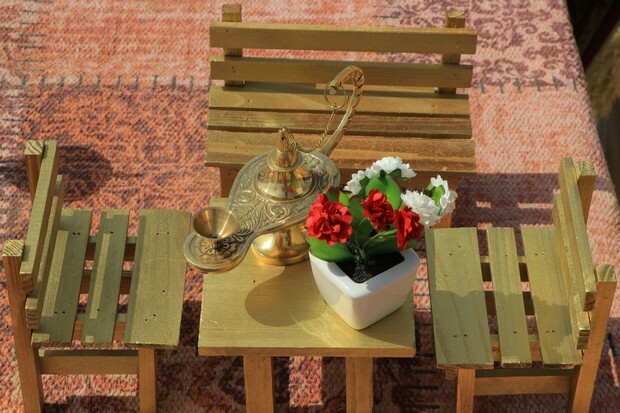 The tables were named after Bedouin elements rather than numbered. On each table there was an explanation of their table name placed in a message bottle. 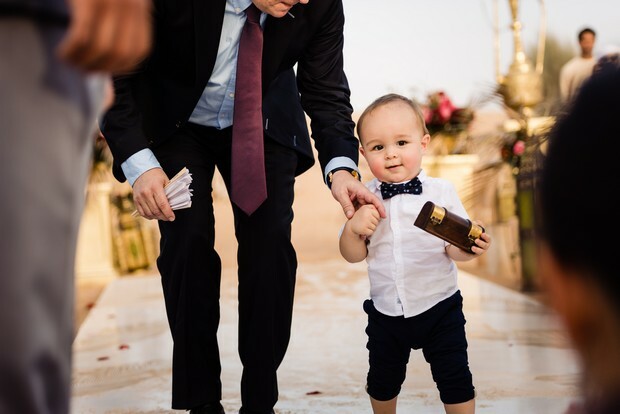 It was a truly family affair with a kids’ tent with each child having a personalised box filled with goodies and games. To find out more about Aghareed and if they are available to style your big day, pop over to their profile page now.